If you are seeking electrolysis, you should expect to find knowledge, experience, skill, expertise, compassion and a passion for the Electrolysis profession PLUS the most effective and advanced epilator on the market, ( Apilus XCell ). I have over 11 years of passionate & specialized experience as an Electrologist. In May 2017, I opened The Best Electrolysis inside Delaney Salons, Coppell, TX. I previously worked for over 8 years at a day spa in Coppell, TX. Prior to working at the spa, I had a home-based electrolysis business in North Dallas. I retired as a Flight Attendant for a major airline and chose to pursue my passion for electrolysis as a second career in early 2008. My business, The Best Electrolysis, has 5-star reviews from happy and satisfied clients on Google and Yelp. Please see reviews on me from my previous employment. I am conveniently located for clients living in Coppell, TX. Irving, TX, Lewisville TX, Flower Mound, TX, Carrollton, TX and the surrounding DFW area. I am an artist, also, and you are my canvas - I love seeing the amazing results of electrolysis on my clients! I am an acrylic fine art painter and art workshop teacher. I display my artwork at juried art festivals, art exhibitions, and art galleries. In 2017, my artwork was published in the newly released North Light Books’ fourth annual Best of Acrylic competition AcrylicWorks 4: Captivating Color. Below is my website for my paintings. I use surgical loupes with 3x magnification. These loupes are widely used in both surgical, dental and medical procedures to enhance visualization of tissues and to facilitate optimal instrument placement. This ensures greater comfort for the client plus effective and destructive treatment of unwanted hairs. New electrolysis clients will receive a free 30-minute consultation prior to the first treatment which will consist of your filling out a brief medical history. I will explain the electrolysis procedure that best suits your needs and an estimate of how long it will take to complete the area. You will receive 10 minutes of free Electrolysis hair removal treatment to see how the electrolysis procedure feels, and how the skin reacts. Do not be afraid to ask questions, especially when it concerns your time and money. I love to answer any questions and concerns that you may have. Your daily appearance is important to me and to you. Each electrolysis session will consist of customized treatments that are formulated for YOUR sensitivity, skin and hair types. Your electrolysis sessions will have minimal to no skin reaction. There may be a slight redness in some treated areas of your skin, but this usually diminishes within an hour or less. You will feel attractive at all stages of your treatment. Professional electrologists practice strict sanitary procedures to protect your health. I will be using gloves and sterile, disposable probes for your hair removal treatments. All tool implements are sterilized in an autoclave or dry heat sterilizer. Sterilization is a part of daily life for a professional hair removal provider and I will gladly discuss the sterilization and infection prevention procedures that I follow. Like all medical professionals, privacy is a standard of care. Professional electrologists are fiercely protective of their clients' confidentiality and you should expect nothing less. If you have skin that pigments easily or if you have deeply hooked, curved and/or embedded (ingrown) hairs. I specialize in galvanic blend treatments that prevent pigmentation by using little to no perceptible heat in my special blend formulas. I have over 10 years experience working with the Blend method. There are not a lot of Electrologists that fully understand and utilize the Blend's amazing capabilities. 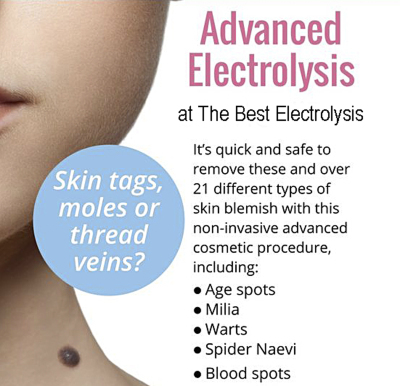 ​​ I specialize in Advanced Skin Care by Electrolysis - the removal of benign skin lesions without scarring. PERFECT SKIN is the goal - with no telangiectasias (small red lesions, sometimes spidery in appearance), cherry angiomas (is a mole-like skin growth made up of small blood vessels), spider veins, skin tags, pigment spots (or age spots) and moles. The revolutionary Synchro technique (pictured above left) is a patented feature of the Apilus xCell. The Synchro radio frequency is very effective for deeply rooted, stubborn hair. Its simultaneous application of approximately hundred 27MHz picopulses, of less than .002 second each, can intensely destroy all germ cells located between the bulb and the bulge of the hair follicle with little to no perceptible heat. The Synchro mode is the best way to destroy more unwanted hairs in less time. The Apilus xCell is 35% more powerful than any electrolysis epilators on the market. This additional power provides a faster destruction of the cells responsible for hair growth, and therefore a higher level of comfort and effectiveness. The ultrarapid pulses are so fast that the body does not register the sensation - consequently, there is no lingering heat to the treated area. Mere thousandths of a second are enough to eliminate unwanted hair! By offering such a high level of comfort, the Apilus xCell has become the preferred solution for all body areas and skin types of clients. Therefore, whether your hair is blonde, black, gray, white or red, and your skin dark, pale or olive, the Apilus XCell will always deliver a 100% effective result.